aldo's been caling 15 bike stores around Vancouver for this Run Bike. apparently, it's so in demand that parents are calling all bike stores and placing orders like crazy. finally, someone called aldo back to tell him that the shipment was coming in that day so off he went! it's really for a 3 year old but since amori did so well balancing on her Trunki, we couldn't resist getting her a real bike. 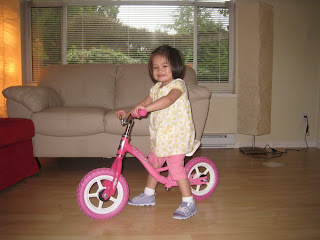 it doesn't have pedals so it'll teach her how to walk with a bike and later on, how to balance herself on the seat. so far so good, she's been loving it! 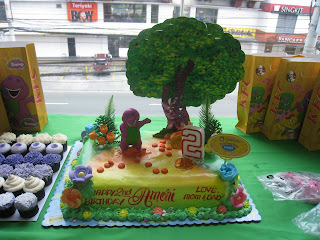 amori turned 2 in manila and celebrated it with friends and lots of family (compared to the 5 family members she has here!). 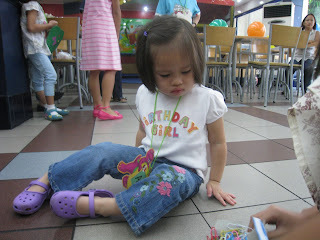 her birthday fell on the same day as my sister's wedding, so we had her party on sunday, the 13th of july. 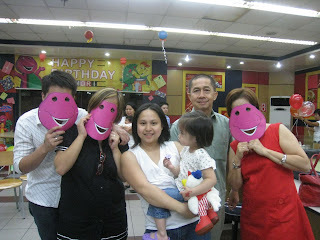 thank God for kid parties in manila - we had a fuss-free party at KFC in Jupiter St., and all we had to do was be there... of course that's unheard-of here where it's DIY all the way! 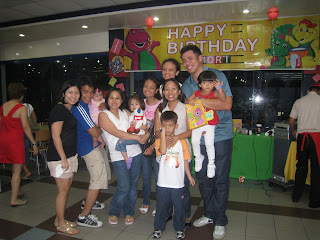 it was great to be around cousins, titos, titas, lolos, and lolas... something that we don't get on a regular basis. 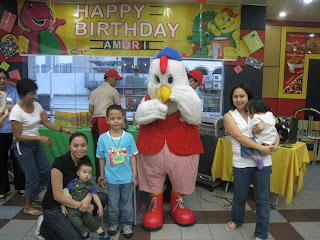 the only bad part was Chuckie the KFC mascot. he scared the hell out of amori. 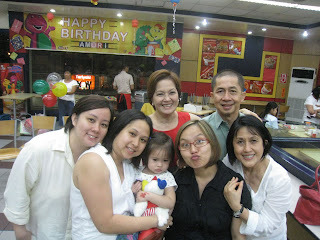 to this day, she still says "scared Chuckie". LOL. - peed in her potty once! - always asks "what's this?" - hums and does the actions to "wheels on the bus", "itsy bitsy spider", and "twinkle, twinkle, little star"
- can eat, and prefers to eat by herself, and does it with minimal spills too! who would have thought 2 years would pass this quickly? "Pati yung pagpo-pronounce ko ng Tagalog ko, medyo minsan may pagkabaluktot, talagang nire-rehearse niya na hindi puwedeng ‘mayor.' Di ba talagang ‘meyor'? At natutuwa ako ‘pag napapanood ko yung preview after every take. Aba, ang galing ko mag-Tagalog!" hagikhik niya. "Gusto ko nang mag-ibang bayan dahil gusto ko ring maranasan ang isang normal na buhay. Maging isang Gretchen Barretto na hindi kilala ng kahit sino. Puwede akong madapa na hindi pinag-uusapan," says Gretchen Barretto. such an effin' poser. reminds me of those filipinos who "forget" their tagalog after a year of being away. as if! we're off to manila for my sister's wedding (which falls on amori's birthday too) - and since it'll just be me and amori again (a new mortgage + rising fuel costs does not make a happy traveling family so aldo's not going), i need all the help i can get. 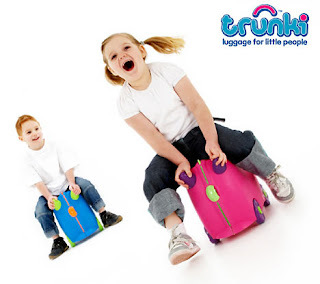 aldo's mom works at the airport and she saw a passenger with a Trunki. we couldn't order it online because it was too late, so i frantically looked for a distributor in manila as well (apparently it's available in Rustan's and Baby & Co.). thank God most stores here are online - we found a store selling one here! she's loving her Trunki and refers to it as "car" or "ride". she got up at 6:30am today to get it from her closet. i hope the novelty doesn't wear out too quickly!